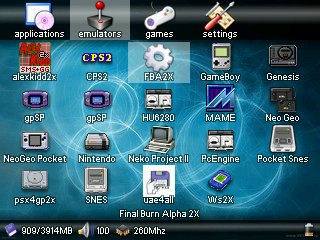 GMenu2X is a very very good alternative frontend for the gp2x/wiz/caanoo. It supports overclocking, sound volume setting, touchscreen, etc. GMenu2X allows you to create direct links for your games & applications so that you can directly launch them without having to browse through all the filesystem manually, resulting in a better user experience. One of my absolute favourite programs as ever, thanks a lot. Here's hoping that GPH listens and we can get apps to quit to Gmenu2x instead of Gp2xmenu in the future. Hmmm. It resets the machine if you go in to the settings menu. I've got it to "see" MAME but it still runs at a snail 533 mhz no matter what settings I choose in the setup menu. I have some minor issues: It doesn't show my movies when I navigate to the "movies" icon (it just quits to Gp2xmenu), and I added a new tab for some of my games and the icon on the top is off-center with no appearant way to center it. Good job otherwise, and there needs to be a way for this to replace the default menu! Gmenu2x > Gp2xmenu! I've spent ages trying to get this to work but I can't get it to run. It just gets stuck on the loading screen and won't work. I tried editing the gpu file and making a new ini file (the one in the other download didn't work) and it still justs get stuck in the loading screen. Any ideas? Works very well and fixes the tv out issus, Thanks.